Masters degree at USA University. 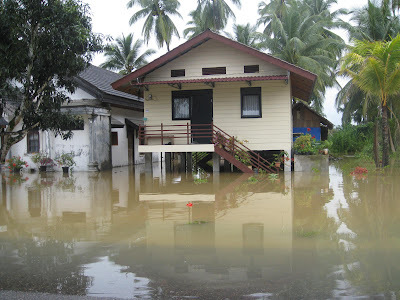 < We have water in our village now, we have a house and my Dad's out fishing. It's been a busy week. I'm exhausted but it has been worthwhile. After four years and a bit working almost full time on the Tsunami relief and recovery in India, Maldives, Sri Lanka and now Indonesia, it is such a joy to see people's lives getting back to normal. Earlier in the week I was in Aceh province of Indonesia where the devastating tsunami claimed almost 300,000 lives. On Monday I was at a ceremony where the President of Indonesia inaugurated a Tsunami memorial museum, a Polytechnic, the new port and many other important facilities for Banda Aceh. 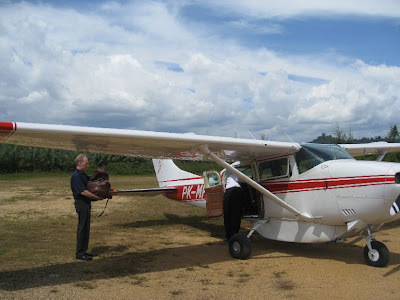 On Tuesday I flew to Calang with the Chairman of the Indonesian Red Cross, the Canadian Ambassador, the Secretary General of the Canadian Red Cross, to inugurate houses built by the Canadian Red Cross in partnership with the Indonesian Red Cross Society (PMI). This is part of the International Red Cross (IFRC) and PMI effort to build 40,000 homes: 20,000 permanent homes and another 20,000 sturdy transitional shelters which will last more than 25 years. It was such a wonderful occasion seeing villagers in their brand new homes and happy. Later I will tell you Mulinda's story about her new life, her new house and Ben's fishpond. 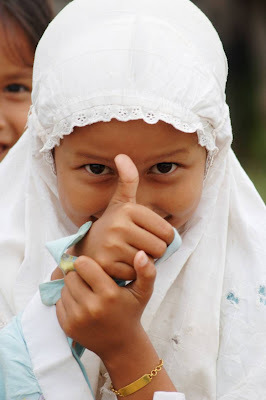 Let me first tell tell you about the village of Mata Ie which was completely devastated by the tsunami that descended upon the west coast of Sumatra December 26, 2004. 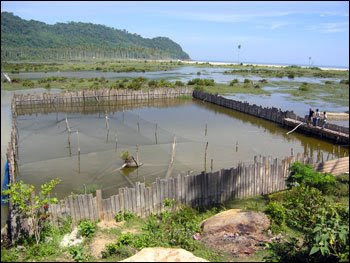 Located in the Aceh Jaya sub-district of Sampoiniet (west of Jeumpheuk), its remains today lie underwater. Much has been accomplished in the years following the tsunami. The Canadian Red Cross (CRC), in partnership with Canadian International Development Agency (CIDA), and PMI, helped rebuild Mata Ie, bigger and stronger than it was before. 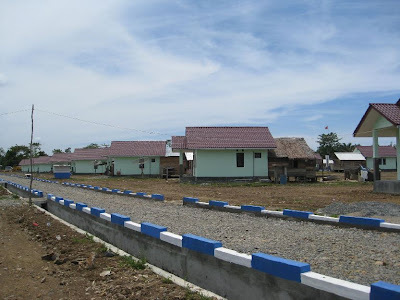 CRC is building over 5,500 houses in 49 villages in Aceh and Nias. Mata Ie is one of those relocated villages, its original location is now lying some four kilometres away from the shore of the Indian Ocean. Getting relief supplies and housing materials out to remote areas was a logistical nightmare. 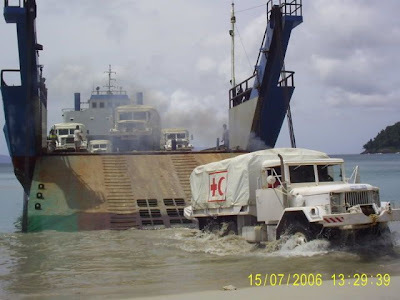 Here we are taking M6 trucks supplied by Norway on landing crafts, plus bulldozers, to make roads so we can transport materials. Their new land was generously donated by the village of Arongan Lambalek, to the west of Cot Langsat. 68 light green houses with the distinctive red roofs of the Canadian Red Cross now sit on these 26 hectares of land. More than half of them are already occupied. Despite the many lives claimed by the tsunami, the population of Mata Ie has actually grown in recent years. Residents opened their hearts and welcomed close to 100 of their closest neighbours, displaced themselves from their own homes in Jeumphuek, Cot Langsat and Babah Nipah. More than 220 people now call Mata Ie home. I think the Red Cross built houses are great ! Residents may have lost their homes in the tsunami, but they did not lose their livelihoods. Many have returned to their lives as small business owners; as farmers and fishermen.There are no schools in this village. Children attend schools in nearby communities, taking their studies very seriously. A nurse at one health clinic in Mata Ie attends to the medical needs of residents as they arise. Once a month, a travelling health clinic visits. Mata Ie is a community that gets along with its neighours, as well as local levels of government. It’s an inclusive village that encourages women to take a larger role in making decisions that affect the entire community. And it is very welcoming to the Canadian Red Cross and its staff. 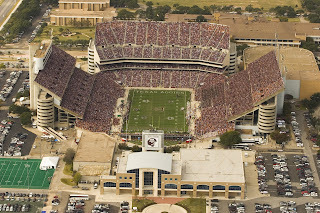 CRC could not rebuild Mata Ie alone. 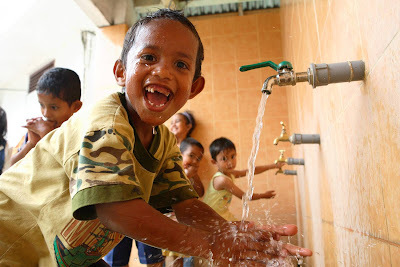 It took commitment on the part of many partners, including the villagers themselves, CIDA, BRR (Government of Indonesia Housing Agency) which is constructing permanent infrastructure, and American Red Cross, which is supplying water and sanitation to all of the homes. The CRC commitment did not end there. Making a conscious decision to build communities, not just houses, CRC embarked on programs that would improve the health of Mata Ie villagers, through improved water and sanitation, and hygiene promotion. The CRC Livelihoods Program saw the successful construction of a volleyball court; volleyball is a favourite pastime of the Acehnese. Residents of Mata Ie admit to still being traumatized by the tsunami and living in fear of future natural disasters, including earthquakes. Villagers admit to still being traumatized by the tsunami. 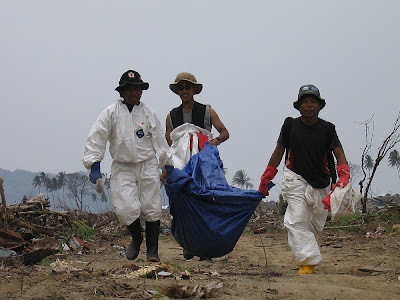 In days that followed the Tsunami, Red Cross volunteers disposed of bodies under terrible conditions, but with the greatest possible dignity. To help mitigate those fears, CRC introduced Disaster Risk Reduction programs to the area, so next time, not only will residents be better prepared for a natural disaster, they’ll also be better able to respond. When the 2004 tsunami swept away her family home on the island of Pulo Breuh, Mulinda was seven months pregnant. Her daughter was born on March 1, 2005, while they were living in a camp for the displaced called Mata’ie (“tears”) near Banda Aceh. Now three years old, little Saidatul Rahmi deftly cuts and pops slices of apple into her mouth on the doorstep of their new two-bedroom house, built by the British Red Cross. Unlike many other families in Ulee Paya village, which has 300 inhabitants, Mulinda’s relatives all survived the disaster. But there was nothing left of the home she had lived in with her parents. It was five months before they were able to return to the island, just off the northern tip of Indonesia’s Aceh province. Mulinda, 30, moved into the yellow Red Cross house with her husband and daughter in 2007, and her parents live close by. Trees and pots of pink flowers grow in the front garden and there is a wood-frame carpentry workshop at one side, where Saidatul’s father makes furniture. 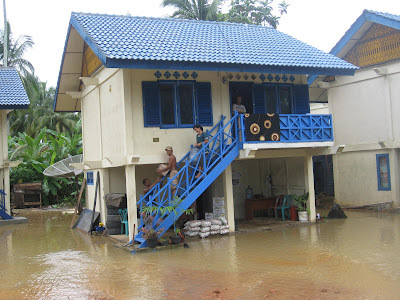 After the tsunami, most people needed new furniture, so orders have been coming in from neighbouring villages too. The business has taken on another employee. Mulinda’s family seem happy in their new concrete-brick home, which is one of 47 the Red Cross constructed in Ulee Paya. Hopefully they are also better protected against damage from future disasters. 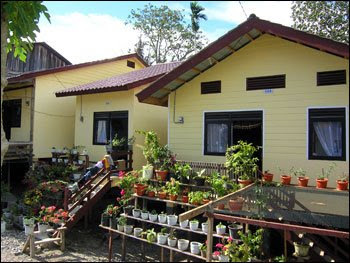 All Red Cross houses in the tsunami-affected area of Indonesia are built to withstand earthquakes up to magnitude 6, and should protect people inside up to magnitude 7. “We sometimes have earthquakes, but when they happen, the house just shakes. There aren’t any cracks,” says Mulinda. Before the tsunami, Ben Khari’s home village of Alue Riyeung, on the north Acehnese island of Pulo Nasi, looked out over rice fields, separated from the beach by a swamp filled with coconut palms and mangroves. But the huge waves that smashed into the island’s coastal villages flooded the area with seawater and ripped out the trees. The semi-circle of land is now abandoned, dotted with large pools of stagnant water and tree stumps. “It’s no good for paddy anymore, because without trees, the wind will blow in and damage the rice,” explains Ben. He and a group of five other resourceful villagers put their heads together and came up with a fresh way to make use of the ruined fields. With the aid of a group grant of 3,164 Swiss francs from the British Red Cross, they have constructed a large fishpond at one edge. First, they fenced off a 30 square metre section of stagnant water using debris from coconut trees destroyed by the tsunami (this, Ben boasts, took them just a week). Then, in April, they stocked the pond with around 3,000 bandeng (milk) fish, which they bought in the provincial capital Banda Aceh. Because they’ve opted for a non-intensive method, the fish won’t be ready to sell until late August. Every morning, Ben or one of his partners heads down to the pond to give the fish their daily ration of three kilos of semi-organic food. Ben is keen to stress the ecological benefits of their approach, as well as pointing out that it’s cheaper. High-nutrient food is expensive, and because they used a flooded patch of land and recycled timber, they didn’t have to hire a digger or purchase fencing materials. The group members don’t have to rely on the fish project for their main source of income, so they are treating it as an experiment for rehabilitating the wide expanse of land damaged by the tsunami. “We are aware that this activity takes a long time to produce benefits, but we see it as a good way of exploiting the potential of the natural resources here. It’s an investment,” explains Ben. “We also come here and relax with the family, so we’re all doing this project merrily,” he smiles. Thanks to Megan Rowling, British Red Cross abd Kathy Mueller, Canadian Red Cross for ptoviding information. "Hi, excuse me, hello, sorry to interrupt, but I just wanted to ask what CD the track that is playing now is from.."
"Oh yes. That'll be The Brits 2009 compilation." "I don't mean to be rude, but its not. I'm not questioning you, but I'm just telling you, it isn't from that CD. This is why I was asking, as its not on any of your Now Playing displayed CD's." "Oh," frantic looking around, "Errm." "Its just The Brits CD doesn't do remixes, and this is a remix of a track by M.I.A. called Paper Planes. I just wasn't sure what remix it was." "Are you sure it isn't on The Brits CD?" Looks at the tracklisting. "Oh," picking up a Motown compilation, "It might be one of the others." "No, it isn't. Its definately not considered a Motown classic and is not from the latest Take That album... I know who it is by and what the track is --"
Interrupting, "So what was it you wanted to know then?" "It is a remix and I just wanted to know who by and it isn't on any of the CD's that I can see." "Oh, well, errm... I'm not sure what to suggest." "Nevermind, it is okay, thanks for your help anyway, thanks, bye, thanks." Under breath, "I don't even care... Or have the will to live." It was the DFA remix. This is more a call to Rob Jones than a review of the actual event itself. I am a little-known blogger, occasionally, but mainly I am a music and gig addict (not to mention the band t-shirts, lets not go there, one draw no long suffices). I happened to blog about you a year or so ago. And upon seeing that you were billed as playing at Darlington nearly deafened nearby dogs when I yelped with delight. I arrived not long after 11:30pm, not for the club night, but to see yourself. I was quite shocked. I mean, people are nice and all, but, well its people in Darlington wanting to get smashed to familiar tunes. But I must say I am glad I waited it out and stayed for your performance. You guys were fantastic and I was incredibly won over with all aspects of your set. 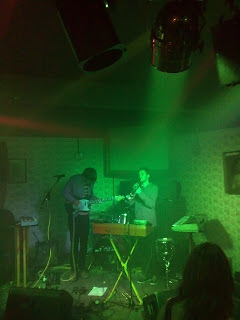 Despite the poor sound quality of the soundsystem in there I thought all your sounds translated beautifully live. Pre-recorded sequences, drums, trumpet and quite obviously, your gorgeous and ever-giggle-inducing lyrics. I was a little worried that after that gig that the North East of England may not have the pleasure of your presence again for a while and wanted to intercept this early! Come back. Just maybe ask me about venues/club nights first. PS My boyfriend had to be comforted due to your not having any t-shirts with you. However, come pay day I will make him smile again! An open letter/request/bordering on petition to The Voluntary Butler Scheme. Here is the video for Multiplayer. Buy the single when it is released on the 2nd March! Imperative. I have been thinking lately about some of the best mountain climbs I have done, and they usually involve humour, sometimes a prank, but always a fun group of people. On this trip we also rediscovered the Great Spotted Kiwi in this region. 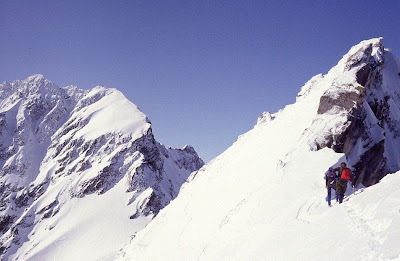 Here is an article I wrote for the 1993 New Zealand Alpine Journal. About this time we finalised the group for Red Lion: Kevin Williams, 44, a carpet layer from Greymouth; Rod Buchanan, 52, bee keeper from Paroa; and David Norton, 34, a university lecturer from Christchurch. Peter and I made up the complement of five. The sixth member was to have been well-known mountaineer and publican of the Bealey Hotel at Arthurs Pass, Paddy Freaney, but he was snowbound and unable to get over the pass to join the others. When I phoned Paddy shortly before we left, he said: “The only way I can come over is to flog a jigger and come through the tunnel to the West Coast.” Unable to commandeer a jigger, Freaney missed the trip. of this period saw three days of torrential rain. This was followed by two days of heavy snow which dumped two feet of snow in Christchurch’s Cathedral Square and on the Southern Alps. Acutely aware of avalanche danger, we went in well equipped to face any eventualities. of good weather. Our five-man party flew by helicopter into the terminal face of the County Glacier at 4,000 feet and in the afternoon plugged footsteps up to 6,500 feet under Red Lion Peak (8,100 feet), so we’d get a flying start in the morning. As night closed in on our three tents, water froze solid in the billies. degrees below freezing as Peter Hills ex-Army combat boots froze solid during the night. Somehow his boots and camouflage trousers issued for Singapore conditions looked a bit out of place in the middle of severe South Island winter. 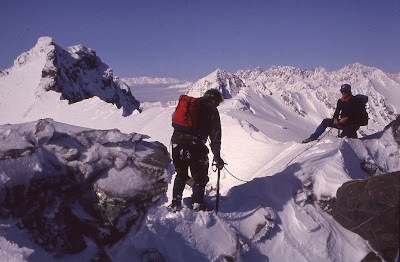 It was a weak, wintry dawn that greeted us as we climbed up the County Glacier towards the base of Red Lion Peak. We commenced the ascent of the low peak of Red Lion Peak by the north facing slope. At 11.30am after two hours of steep climbing we reached the low summit, at 8050 feet. opposite side of the County Glacier, Mt. Evans reigned supreme. An hour later we reached the high summit of Red Lion Peak. Peter was chuffed. As we ate I told the guys the history of Red Lion peak. Tunisia when he was struck by a splinter from a stray bomb. morning the weather closed in, and our chance of a winter ascent of Mt. Evans was lost. As we left our camp in falling snow, the hardest part of the trip started. It took us four and-a-half days to descend down the County Glacier, County Stream and the Waitaha Valley back to our car at the roadend. The first stage of our trek back, with 70 pound packs,including tents, primuses, avalanche, climbing equipment and food, was down the snowladen County Glacier and then the stream. 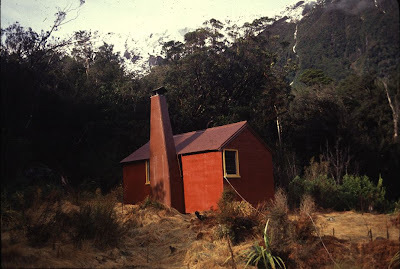 At times the snow was crutch deep which made the trip to County Hut slow and laborious. Board, estimated there were at least five trees blocking our way every 100 yards. He reckoned it would take about two person-years to restore the Waitaha Valley to the condition it was before this winter’s snow and wind damage. Hokitika. Peter Hill was pleased to be home and was greeted by his sister Margaret, who had been running the pub during his six day absence. Peter sat down, like a happy Buddha, in front of huge roaring fire. It was beers all round, huge tankards of Christchurch Dark Ale. Before long our wet clothes were steaming. A week later Peter Hill’s patrons treat him with greater respect. He’s much slimmer now and seems to have more purpose in his stride as he moves from table to table. The summit photo of Peter and his team proudly hangs on the wall, near the bar. Last Friday a tourist asked him why he doesn’t have more photographs of mountains on his wall. 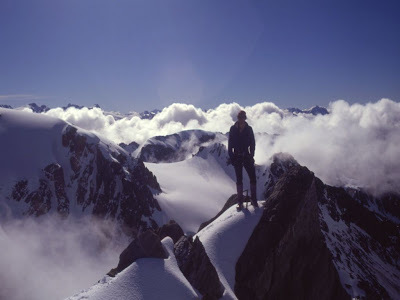 “Have a look out the tavern window, you can see bloody mountains as far south as Mount Cook and Mount Tasman,”’ he replied. “Are you a climber?” the tourist asked. There was a silence while he thought. “I’ve climbed a mountain or two,” said Peter, as he glanced towards the silhouette of Mt. Evans, which hides Red Lion Peak behind. The view out his pub window now has new meaning. Disorder and chaos. I mean, it really has got to be expected. After all it is The Cribs. It seems a while ago now but Sunday 8th February saw myself and my lovely boyfriend in Bradford. Snow falling, lapping the city center for a restaurant, and my boyfriend jumping in icy puddles. A few hours to kill before The Cribs and we were excited. The boyfriend is a big fan and takes to putting on his Cribsmas DVD whenever I'm not in the room and then convinces me to leave it on with promises of glimpses of beards or Nick Hodgson. I am not as dedicated a fan as he, but have seen them more than he has, I just love gigs. Plus, seeing The Cribs live is not something I'd ever turn down. Because, although I may lack the sheer enthusiasm my boyfriend has in abundance for the Jarman's, seeing them play live is an absolute treat. Indulgently, I like to observe the entire spectacle. Not just their performance which is always laced with haphazard, yet charming, inconsistencies. Sibling similarities but stark differences and approaches. Personally, my crush tends to lean quite unshakably towards Ryan and the boyfriend's, well, he is a Gary-lover. But the thing that I enjoy most of all is to watch the massive out-pouring of dedication and adulation from the audience and Cribs-worshippers. I genuinely love just looking and taking in the adoration that swarms of independent beings collectively muster for this band. I mean it, if you get the chance buggering go! Ignore The Cribs for a moment or two (especially Johnny Marr), detach yourself from the ongoings and experience what it is that The Cribs still manage to foster in people. The St. Georges Hall in Bradford is a great venue. And getting to go there again was such a treat for me. The city of Bradford helped shape me and going there made my heart ache, in a good way. I am constantly singing and dancing to this. In the depths of quiet I will burst into song! Advice to your children - leadership personified. My last posting was on leadership and management and it engendered some lively feedback and discussion. Having been in leadership positions for a number of decades from leading mountain rescue teams and having to make life-saving decisions, directing outdoor education centres where the wrong decision could result in death, or being caught near the front line between two warring factions, and having to decide to evacuate my team or stay put, makes you realize there is a lot of clap-trap written about leadership by academics who have spent little time in the trenches. I was fortunate in being able to learn from my own experiences and by listening to my elders over the years, both Pakeha (European) and Maori. In my last posting I listed the qualities and differences between leaders and managers and the most important to me is this one. • The manager focuses on systems and structure; the leader focuses on people. What will my answer be ? 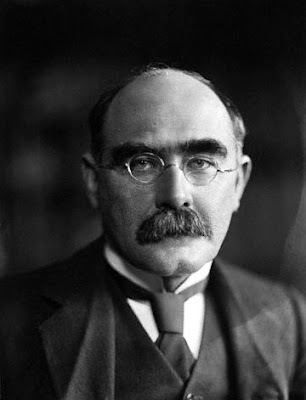 I believe I cannot fail them if I quote Rudyard Kipling’s poem ‘ IF.